The Whippet love their people, are also good with children and other dogs. They are quiet and calm dog when inside the house. They are gentle, affectionate, and friendly. 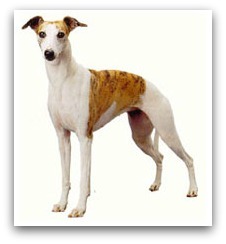 The Whippet originated developed in England. Greyhounds were crossed with the Italian Greyhound and another types of terriers at the end of the 19th century. They were developed to become much more smaller than Greyhound, and easier to feed, yet able to hunt, sighting, watchdog and racing. They is an outstanding track racer and can move very fast. The breeds of dogs was registered with the AKC in 1888. The Whippet may be smaller and look similiar to Greyhound but is a true sighthound. They has a short, close and smooth coat. Coat is fairly weather resistant given the length, and texture. The coat colors comes with solid colors, patches of colors, brindle, black, red, fawn, tigered white or slate blue, or mixed. These dog breeds is very intelligent, but they are also very independent. Some can be difficult to housebreak. They do need a gentle and warm handler training, as the breed can be sensitive. Socalization is important, show lets these dogs to get along well with other dogs, as they can be shy or fearful if undersocialized. They do well in obedience training. The Whippet's smooth and short coat is easy to groom. The coats need only weekly brushing, brush with a firm bristle brush. Bathe and dry shampoo when is necessary. They is an average shedder, they practically sheds no hair at all. The Whippets makes an excellent family pet. They is gentle, affectionate, friendly, and easygoing. They could be very funny, playful and very love their families members. They can be good with children and also with other dogs. They are a very quiet breed. They like to chase anything that is moving. The primary health concern is eye defects.